The results are in from my 3 Day Refresh! I’m down 2.6 lbs, my bloat is gone, my willpower has skyrocketed and my energy is up! You are probably wondering…what exactly is the Refresh? 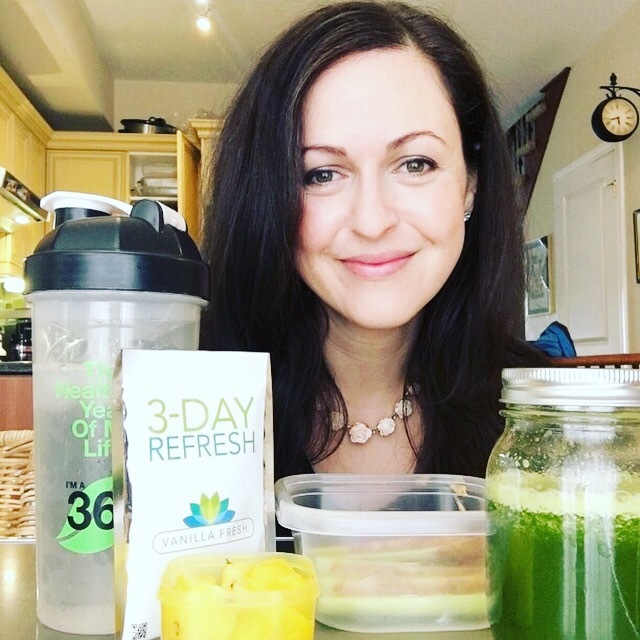 The 3 Day Refresh is a plant-based 3 day cleanse that is meant to jump start weight loss, break a plateau or get you ready for a trip or special event. It is NOT the kind of cleanse where you have to worry about running to the bathroom. It’s a gentle, natural detox that will help you get back on track. I decided to do it after Passover and after Jake’s birthday weekend as I had more than my fair share of sugar and glutenous deserts. 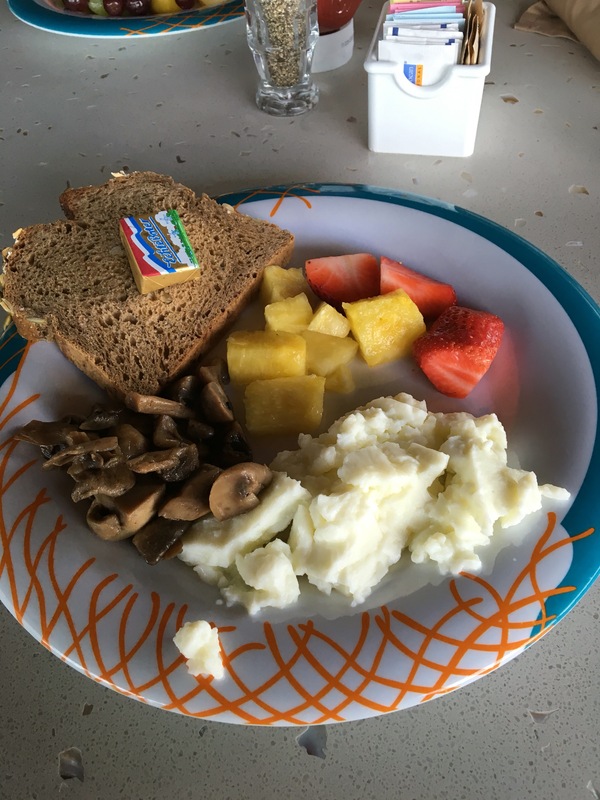 I felt like I needed a good sugar detox, and plus I wanted to look and feel my best before we headed out to Punta Cana for the Team Beachbody Success Club Trip! So here is the scoop on the Refresh! When you wake up you start with a large glass of water. You can still work out during the Refresh but I decided to go with lighter workouts to give my muscles and joints a rest. I did yoga on days 1 and 2 and a low impact cardio workout on day 3. After my workout I had my Shakeology blended with 1/2 a banana as my serving of fruit. The program comes with a complete manual that gives you a list of what foods you can eat, at what time and what serving size. For a mid morning snack, I had the Fiber Sweep! Fiber sweep is made up of psyllium, flax and chia and it contains a combination of soluble and insoluble fibre – 13 grams of it! It has a bit of a lemony taste – you mix it with water, stir, stir stir and then drink. For lunch you have a shake called Vanilla Fresh. It is a plant-based protein shake and I thought it tasted great! You also get a serving of fruit, veggies and a healthy fat. I had pineapple as my fruit on day 1 and 2, and then cantaloupe on day 3. I had celery with almond butter for my veggie and healthy fat and it was yummy! During the program you also drink lots of water and green tea. I was peeing a lot 🙂 All these liquids helped to keep hunger away and they also made my skin glow. It made me realize that I should be drinking more every single day, not just on Refresh days! For my afternoon snack every day I made a juice with mostly veggies and a bit of fruit in my juicer. You also have the option of having a serving of veggies with healthy fat if you don’t want or don’t have access to juice. Dinner is another Vanilla Fresh and then a veggie based dinner, made with a recipe from the manual. I had steamed broccoli with coconut oil and sea salt on day 1 and 2 and it was DELICIOUS! I know that might sound weird, but when you cut out sugar and the processed stuff your taste buds change immediately and fruits and veggies start to taste AMAZING. On day 3 we were at my mother-in-laws for dinner so I had some roasted brussel sprouts and salad with olive oil and balsamic vinegar, along with my Vanilla Fresh. Yes you CAN do this cleanse and go out and continue on with your normal routine! I’ve done the Refresh 3 times, and this time it was the easiest for me BY FAR! Why? Well first I knew what to expect. I knew I might be a little hungry at times but I would survive. It’s honestly more of a mental challenge than a physical challenge. I also had a group of amazing ladies that were doing the Refresh with me. Their accountability and support kept me going when I wanted to quit! They also got some amazing results – their weight loss ranged from 4-6lbs in 3 days. Pretty awesome! I was also really motivated to get some great results before our trip. Let’s be honest here – I wanted to feel good in my bikini and not feel bloated and gross! So let’s talk about my results! In the 3 days I lost 2.6 lbs. I think it might have even been a bit more….but I had to weigh myself at the end at 3am because we were up early to catch a super early flight to Punta Cana! That early in the morning my body didn’t want to….how can I say this….eliminate waste. Sorry if that is TMI. LOL! A few hours later that probably would not been a problem and I bet I would have reached at least 3 lbs of weight loss. 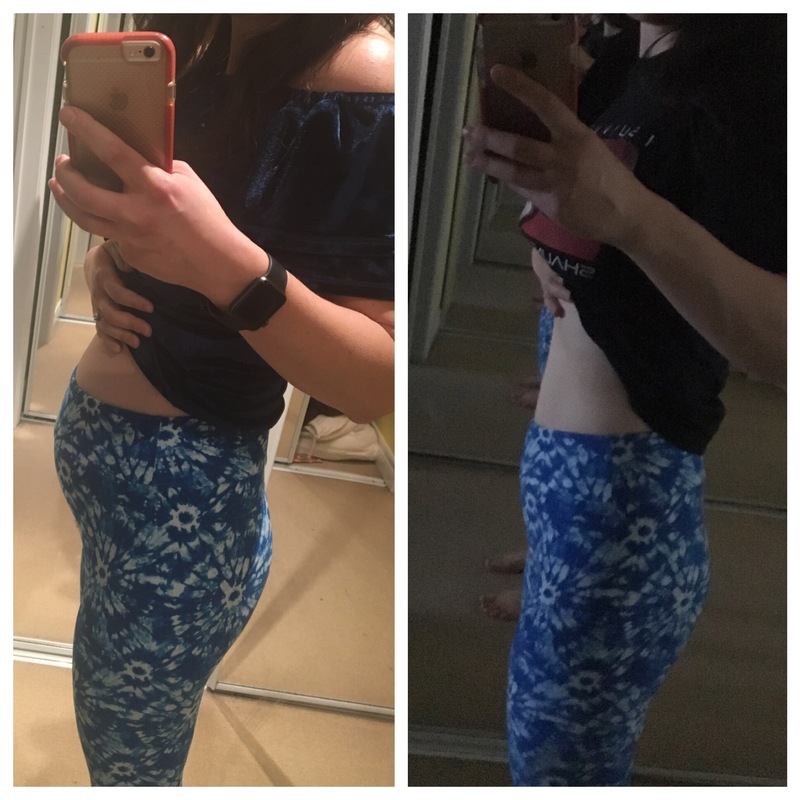 ANYWAYS….it doesn’t even really matter….because I think the pictures show exactly what happened to my body on the Refresh – my bloat disappeared and my stomach fluff disappeared. I also felt GREAT! I felt energized throughout the Refresh. I wasn’t dragged down by starchy carbs, sugar, dairy and animal proteins. The day after I finished we travelled to Punta Cana. I was motivated to keep the results of my hard work and not ruin how good I was feeling. Since the Refresh I’ve been eating more fruits and veggies than normal…and I’m eating fewer starchy carbs, and less dairy and animal protein. I also feel less hungry than usual, which is a nice side effect! Also – I feel like my willpower and resolve are stronger than ever after finishing the Refresh. Sticking to the plan for 3 days has made me realize I can do anything I put my mind to! What I put in my mouth is ALWAYS my choice, no matter what is happening around me. Emotional eating….shoving random chocolate chips in my mouth…eating sugar to soothe myself….these are all things I have done before….but in the long run they just make me feel WORSE! Doing the Refresh has definitely made me more aware of my emotional eating habits. If you would like to try the Refresh and if you would like to join our accountability and support group, please send me a private message via Facebook or email me at sheryl@ikor.com. Our group starts May 1st! Don’t delay contacting me as you will need about a week for your materials to arrive! Categories: Discipline, Juice, Three Day Refresh, Uncategorized | Tags: 3 Day Refresh, cleanse, detox, weightloss | Permalink. 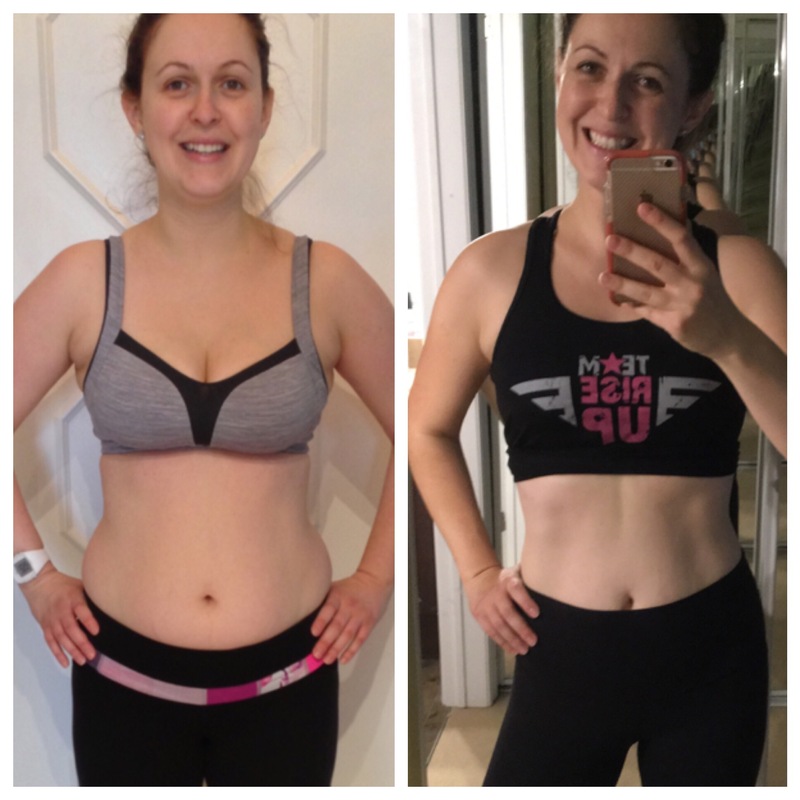 As a coach I’m always sharing before and after pics….I’ve shared lots of my own over the last 3 years and I’ve shared many transformations of my clients. They usually are the result of at least 3 weeks of consistent work with an exercise program and a nutrition plan. This before and after picture is a little different! The before was taken after a night out with friends. We went out to a local Italian restaurant, we had a late dinner, and I consumed things that I normally wouldn’t eat on a regular basis such as pizza, bread, drinks and desserts. It was a fun night and I don’t regret what I ate and drank….but I did pay for it later that evening. I was SO bloated! My stomach looked like I was 6 months pregnant and it felt so yucky. I couldn’t wait to get home and change out of my jeans! That night made me really think about bloating, what causes it in my body, and how to prevent it. I’m going to share a bit about how my body reacts to certain things. I’ve discovered this over trial and error over the last few years. Everyone is different, of course, so if you deal with bloating I think it is extremely important to listen to your body. Our bodies tell us so much if we take the time to pay attention and listen. Most of the time we ignore the signals our bodies give us, and then we pay for that by feeling lousy. I know my body gives me signals that are loud and clear and I’m going to share some of them in this blog post. Avoid foods that cause bloating – For me personally, grains, dairy and sugar all contribute to bloating. I feel better when I avoid all three of these things. I have discovered that my body handles grains better when they are sprouted – such as in sprouted grain bread. My body also does better with spelt rather than traditional wheat, as spelt is easier to digest. My body also prefers grains without gluten, such as oats. I do better when I have grains in very small amounts. My body also does not love dairy. Again, I can have it in small amounts every now and then, but in large amounts it bloats me. I prefer goat or sheep’s milk cheese to cow’s milk cheese. I also prefer to consume dairy in the form of yogurt or cheese rather than straight up milk, as I find it easier to digest. Sugar is another one…it’s ok in small amounts but when I have too much – it leads to severe bloating and gas! I’m not going to fully give up these things forever, but I am mindful as to how they make me feel and I try to minimize the amounts of each that I have. Avoid clothing that cause bloating – I have noticed that when I wear tight jeans and sit a lot, especially after a meal, I become quite bloated. Upon doing some research on Google, I’ve discovered that this is a real thing! When we wear tight clothing around our abdomen, it can make it more difficult for gas to pass along normally and this can lead to bloating. This can also happen with Spanx, which is kind of ironic. We wear Spanx to hold things in, but they can cause a lot of bloating! I discovered this first hand when I wore Spanx a few weeks ago under a tight dress. I could not wait to get home and take them off! Avoid stress – Yes, I know this is easier said than done! However, stress seriously affects our body’s ability to digest food. When we eat on the run or when we feel anxious, our bodies product the stress hormones cortisol and adrenaline, and these both inhibit the working of our digestive system. This can definitely cause bloating. I’ve noticed that when I am stressed or eating quickly, I feel more bloated, no matter what I am eating. I make an effort to sit down when I am eating, slow down, and chew well. Drink more water, but not too much at once – Did you know that dehydration can cause bloating? When we don’t drink enough water, our bodies start to fear that there is a shortage, and we retain water. I feel best when I drink small amounts of water throughout the day. If I drink too much at once that also can lead to bloating, since our bodies cannot absorb large amounts of water all at once. Stop eating after dinner and eat dinner early – We usually eat dinner in our house at around 5:30 pm, and I usually do not eat after 7pm. Why? Because my body needs time to properly digest everything before I go to sleep! When I stop eating early, I feel so much less bloated and my food is digested better. When I eat after dinner, it pretty much always leads to bloating and feeling yucky the next morning. Replace after dinner eating with tea – If you are used to eating after dinner, it can be hard to stop this habit. For me, I have replaced the habit of eating with the habit of drinking tea! I love making my own teas with ginger, turmeric and lemon. I find that these three things greatly reduce bloating as they all have an anti-inflammatory effect. Having tea after the kids go to sleep is a very relaxing habit and something that I have grown to love! If you suffer from bloating, I hope that these tips can help you. Remember to pay attention to your own body. If you feel bloated, write down what you have eaten, how you felt and what you were wearing. Over time you will start to recognize patterns and trends, and you will learn to discover how your body reacts to different foods, to different clothing and to stress. If you need some helping tweaking your nutrition and finding what foods work for you, join our next 21 day health and wellness challenge group starting on April 10th! In this group we will work out daily at home for 30 mins, create customized meal plans that work for our bodies, and focus on ways to de-stress and relax. For more info, please send me a message via Facebook or email me at sheryl@ikor.com. Categories: 21 Day Fix, Exercise, Food, Gluten free, oatmeal | Tags: bloating, Food, Gluten free | Permalink. It’s really hard to believe that we are reaching the end of December and the end of 2016. I will admit that winter is not my favorite season…however….I LOVE this time of year because it just feels so festive! There are parties, beautiful lights and decorations everywhere…the holiday spirit is lovely and helps us get through the short days and long cold nights. I also love this time of year because it’s the time when people are ready to COMMIT to their health and fitness goals, and as a coach that makes me SO happy! Maybe you aren’t quite where you want to be with your health and wellness right now…maybe you have got a few pounds to lose…maybe you want to fit back into your pre-pregnancy clothes….maybe you want to gain some energy and feel good again! If that describes you….you have come to the right place! I would LOVE to help you reach your goals. You may have already heard about the monthly virtual bootcamps that I run. I’ve been running them consitently for the past 2.5 years and they still excite me because of the special women who take part in them! I love helping my clients reach their goals and I love teaching busy women how to make time in their lives for exercise and healthy eating. Registration is open NOW for my January Virtual Bootcamp! Registration CLOSES on December 29th….so if you have been thinking about joining….stop thinking and sign up now! We start January 2nd…..I am so excited and I just can’t WAIT for this group to get going! Are you wondering what the Virtual Bootcamp entails? Let me give you all the deets! A 1 year membership to Beachbody on Demand (BOD) – think of this as the Netflix of workouts…you will have access to every single program Beachbody has ever created, including the classics like P90x and the newest programs like 21 Day Fix, Country Heat and Core de Force. You will also have access to whatever new programs Beachbody releases this year. This means you will NEVER get bored of your home workouts and you have a fitness solution for 12 months, not just for January! A 30 day supply of Shakeology, a superfood protein shake/health supplement. Portion Fix – a portion controlled clean eating plan that focuses on whole, unprocessed foods. It takes ALL the guesswork out of healthy eating and it is NOT a diet…it’s a complete lifestyle change and something that you can follow forever, not just for a few weeks. Access to me as your coach – I will be there for you, cheering you along, motivating you and supporting you. I know Beachbody workouts and the Portion Fix nutrition plan INSIDE AND OUT because I’ve been following them for almost three years. I am here for you 24/7 to answer any questions you might have. 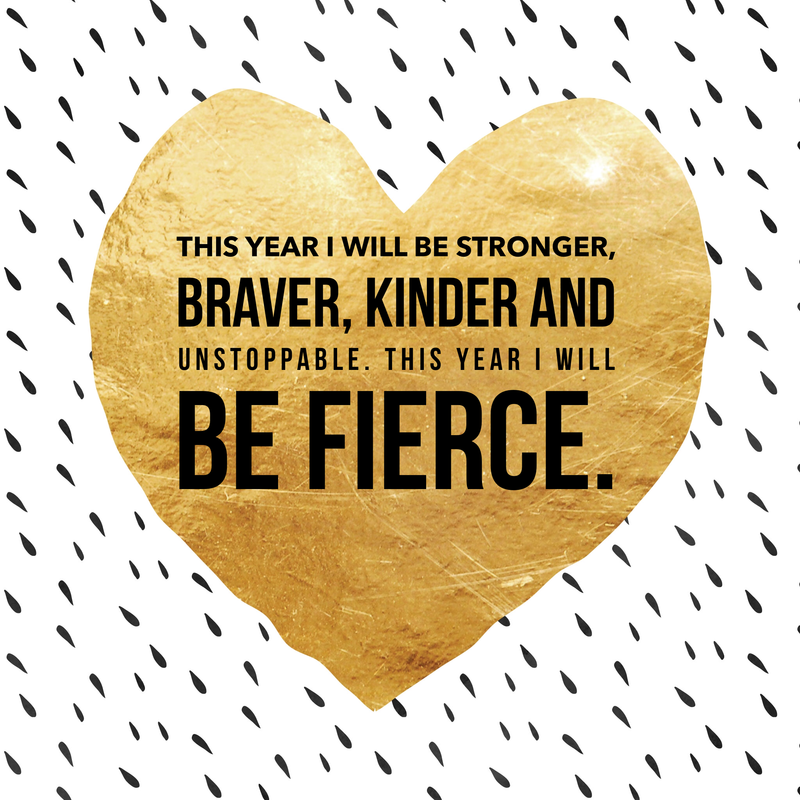 Access to a private Facebook group that I run – in this group you will have the support of other women on the same journey as you. Why go at this alone? It’s so much more FUN and motivating when you do this as part of a group. We share tips and tricks and recipes and support each other through ups and downs. Access to a special tracking app – you can use this app to track your workouts, Shakeology, your weight and measurements. Remember…if you want to create a new habit, the best way of doing so is actively tracking it! This app makes tracking so simple and my clients have been loving it! So you must be wondering…what’s the cost of all of this? The cost is just $199 in the US and $231 in Canada. Yup…that’s IT! That’s pretty much the same as the cost of 2 or 3 personal training sessions, maybe 10 – 15 spin classes, OR a session or two with a nutritionist. For just $199/$231, you get a proven system that WORKS and you get access to it for an entire year! This isn’t a quick fix….this is a complete LIFSTYLE change! This isn’t just about starting and completing one program, it is about moving through each stage of your journey and entering into a lifestyle of optimal nutrition and fitness. I truly believe that the most important part of this whole thing is the SUPPORT! Anyone can buy a workout program, but where you see most people getting RESULTS is when they have a community of support around them helping them stay on track. That is where the magic happens! One more fun thing about my January group…we will be participating in the Beachbody Health Bet! How does that work? Well, Beachbody has created a pot of 2 million dollars. Anyone who qualifies gets a share of that pot. How do you qualify? That’s it! If you do those two simple things, you get a share of the pot. Pretty simple right? A bunch of my clients and I participated in a Health Bet back in September and it was really fun! I found the incentive of a cash prize kept everyone focused and motivated. So…are you in? 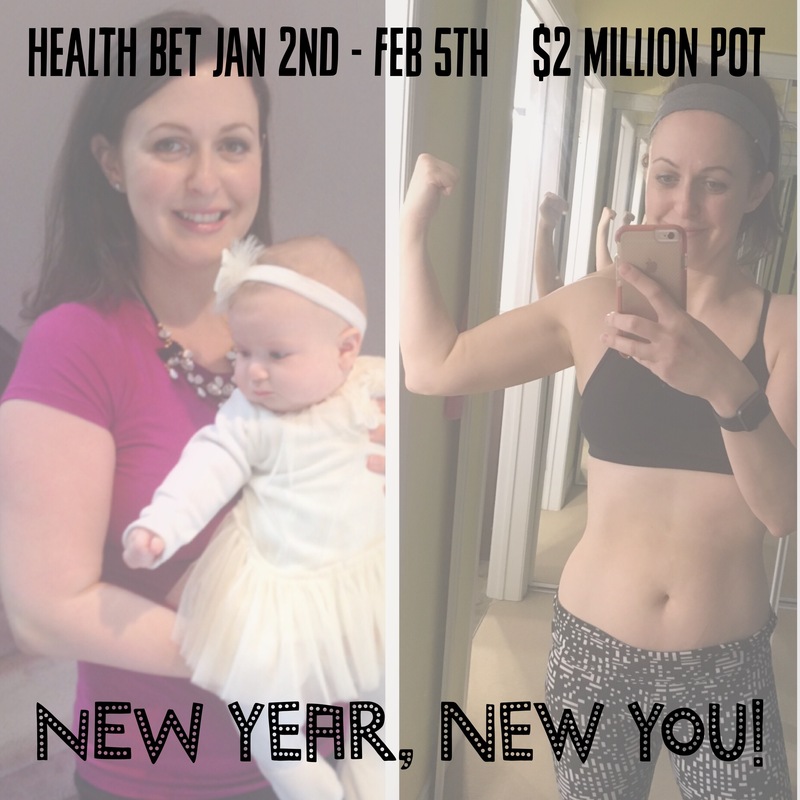 Are you ready to join the Health Bet and participate in our January Virtual Bootcamp? If so, send me a private message on Facebook or email me at sheryl@ikor.com. I can’t WAIT to here from you. 2017 is going to be an EPIC year! P.S. This group is open to new clients, former clients and coaches on my team! Not sure if you experience this too, but I find that summer can be a harder time to eat healthy and stay on track with my nutrition. There are always lots of parties and events, trips to the ice cream store, and barbecues. The weather is nicer and the days are longer and that means I’m spending more time outside and less time cooking. All of these things are very fun, but they can also lead to unwanted weight gain and stomach distress for me (meaning horrible bloating, gas and IBS. My apologies if that is TMI!). 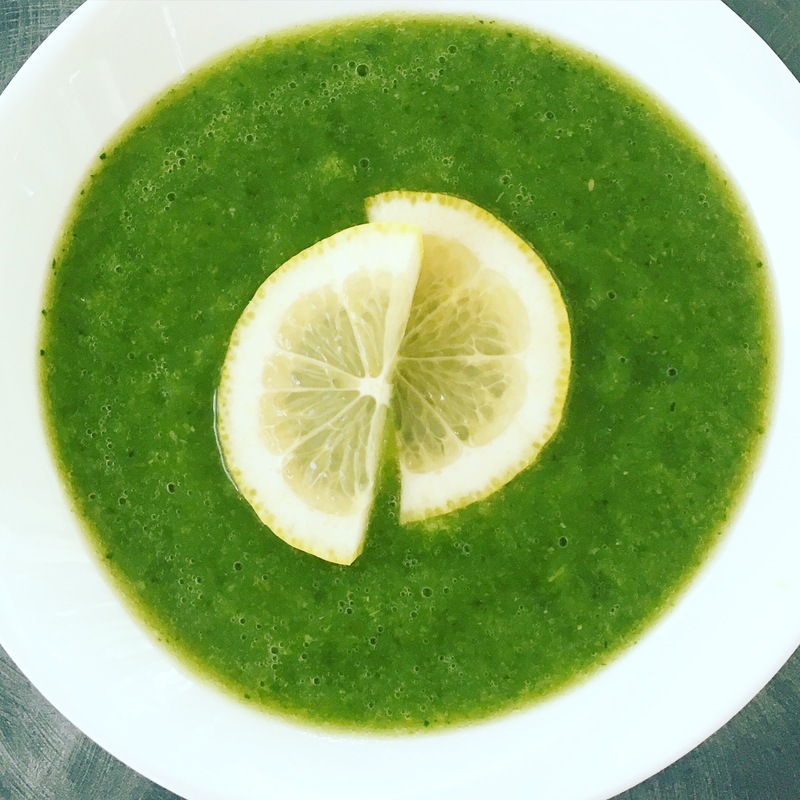 I came across this recipe for a healing vegetable soup a few weeks ago. I saw it on Facebook and then a friend told me she made it and loved it. I gathered up the simple ingredients on the weekend and made my first batch. I will admit that I was unsure of how would taste as the ingredient list was rather simple. However, I was pleasantly surprised. It was quite easy to make the soup and the end product was delicious. It is a really easy way to get in a few servings of vegetables. You can cook up a batch on the weekend and enjoy it all week long. The soup is rich in vitamins and minerals and is very easy to digest. It is healing to the gut and can be the perfect way to soothe your stomach after indulging too much at a summer event. Combine all vegetables and herbs in a Dutch oven covered with water. Bring to a boil, skim any foam that comes to the top, and reduce heat to low. Simmer for 15-20 minutes, until veggies are soft but not overlooked. Puree in a blender and add sea salt to taste. If you are struggling with your nutrition, I’d love to help you. Let’s keep each other accountable this summer. 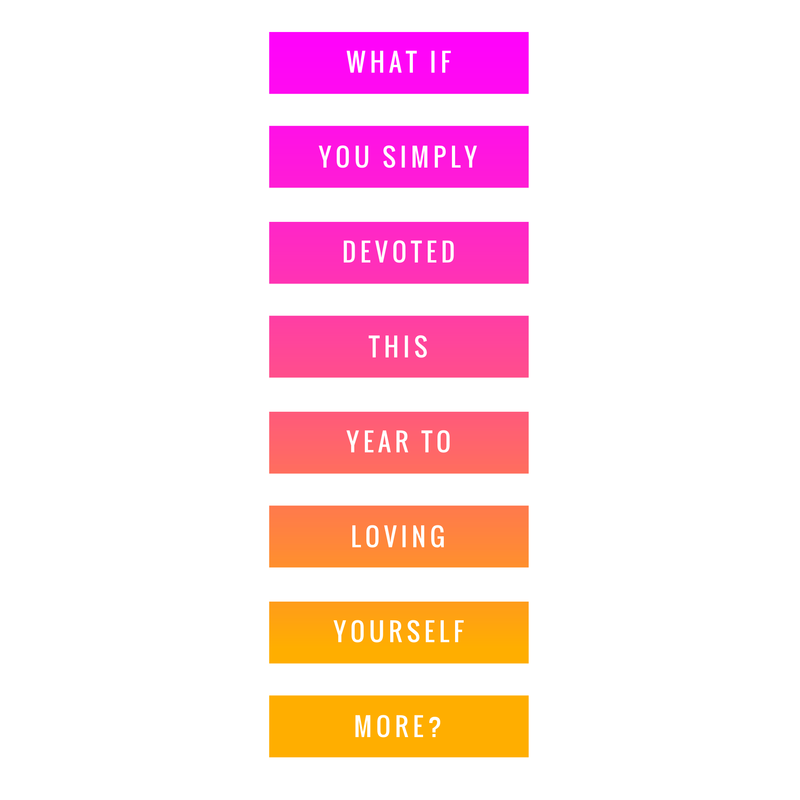 I’m doing another round of the 21 Day Fix starting Monday, July 4th and I’d love for you to join me and a group of amazing women who are all on a mission to feel their best! Work out at home for 30 mins and day, eat clean, and nourish your mind, body and soul. Email me at sheryl@ikor.com or send me a PM via Facebook or Instagram. Can’t wait to hear from you! Categories: Cooking, Food, Gluten free, Vegan | Tags: glutenfree, Recipe, soup, vegan | Permalink. For the past two years, I have been working out exclusively at home, with the very occasional spin class thrown in, and also with occasional outdoor runs. It’s kind of funny, because when I first started working out at home out of necessity, I HATED IT! I thought that I could only have a good workout if I left the house and either went to the gym or went for a run outdoors. Those were my favorite ways of working out before having my third baby. Once I had three kids, it was pretty much impossible to get out of the house each day for a daily workout. When Alex was 4 months old, I was feeling very frustrated as I was missing my daily workouts and a friend suggested that I join her in a home workout challenge ran by Bikini Body Mommy. Not sure if you have heard of that program before, but it actually was pretty decent and I did it for about 60 days, and got some results. However, I quickly realized that if I really wanted to lose the rest of the baby weight, I would need to incorporate healthy eating into my Bikini Body Mommy workouts. That’s when I first heard of Beachbody and the 21 Day Fix. I was looking for a program that had short workouts you could do at home, and that included a simple and effective clean eating plan. 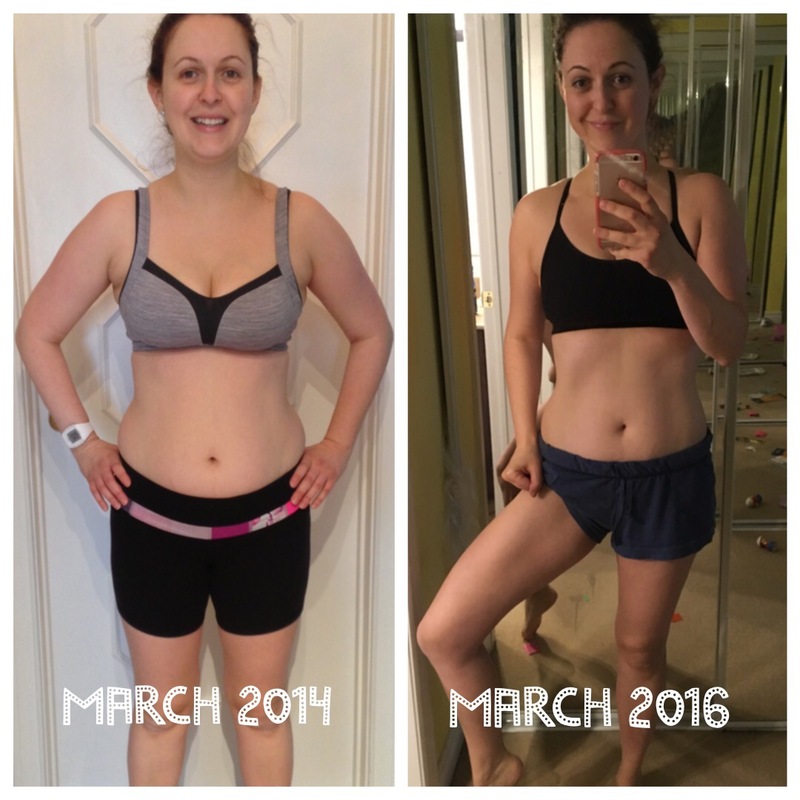 I did a few rounds of the 21 Day Fix, lost 15 pounds, decided to become a coach….and I’ve never looked back. Yes you can get GREAT results at home! Here are the reasons why I love to work out at home! You don’t need to waste any travel time going to or from a gym – as a busy mom of three, I don’t have a lot of time to spare. Even if the gym is just a 5 min drive from your house, it’s still 5 mins there and 5 mins back….and you have to walk from your car inside to the locker room….maybe change….definitely take off your boots and jacket if it is winter….that’s AT least another 5 mins on each end…..so that’s at least 20 mins wasted (probably much more). That’s valuable time I’d rather spend elsewhere. You don’t need to worry about being late for a class – when you work out at home, your workouts start whenever you want them to. You are never late for a class and you never have to rush to get somewhere on time. You can workout in whatever you want and never have to feel uncomfortable about other people looking at you – often I just workout in a sports bra and short shorts because that is the most comfortable! I wouldn’t do that in a gym. There are no gross germy sweaty smelly people around you – if you’ve been to a gym before, you know what it’s like when a super sweaty smelly person gets on the treadmill beside you. It’s even worse when they are hacking and sneezing and have a cold and should have stayed home instead of spreading their germs. Enough said. You never need to worry about childcare – these days I either work out bright and early before the kids wake up or sometimes in the morning when they are already up. Either way, I never have to worry about begging someone to watch them or about dragging them to childcare at the gym. This was particularly useful when I was still nursing Alex and she wouldn’t take a bottle! Your kids get to see you work out and they learn from your example – I read something recently that said there are three ways that kids learn something: by example, by example, by example. If you want your kids to live active and healthy lives, be an example for them and show them how it is done! If you love to work out at the gym, and it’s working for you – keep doing it! If you are struggling finding time for your gym workouts – consider working out at home! If you aren’t currently working out, but wish you were – work out at home! It’s the best! I started doing it out of necessity but now I truly prefer it over the gym. I actually have time now to go to the gym or to go to classes if I wanted to, now that the kiddos are older and are in school….but I truly prefer my home workouts! Want to try the 21 Day Fix? I’ve gathered a great group of women who are all starting the program on Monday, June 20th and we’d love for YOU to join us! Join our supportive community of women who help each other on their journeys towards better health. Be a part of our group – work out everyday from the comfort of your home, learn about portion controlled clean eating and enrich your mind, body and spirit! If you want more info, please shoot me an email at sheryl@ikor.com or PM me via Facebook and I will get back to you ASAP with the details about the challenge. Categories: 21 Day Fix, Discipline, Exercise, Food | Tags: 21 Day Fix, Exercise, Food, home workout | Permalink. 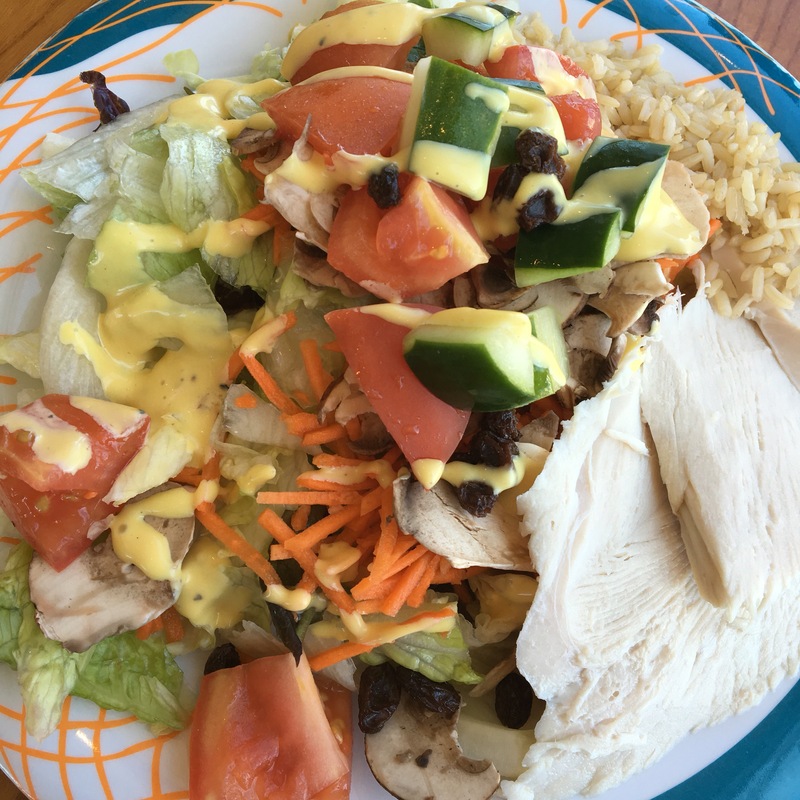 Did you know that the average person gains 5-7lbs on a one week cruise? I’m not really shocked about that. With the lavish buffets, self-serve soft serve ice cream and 24 hour pizza availability….I’m surprised it’s actually not even more! Jake and I just got back from a 5 day cruise on Royal Caribbean’s Oasis of the Seas. Beachbody chartered the entire ship of 6,000 passengers. It was such a great trip! 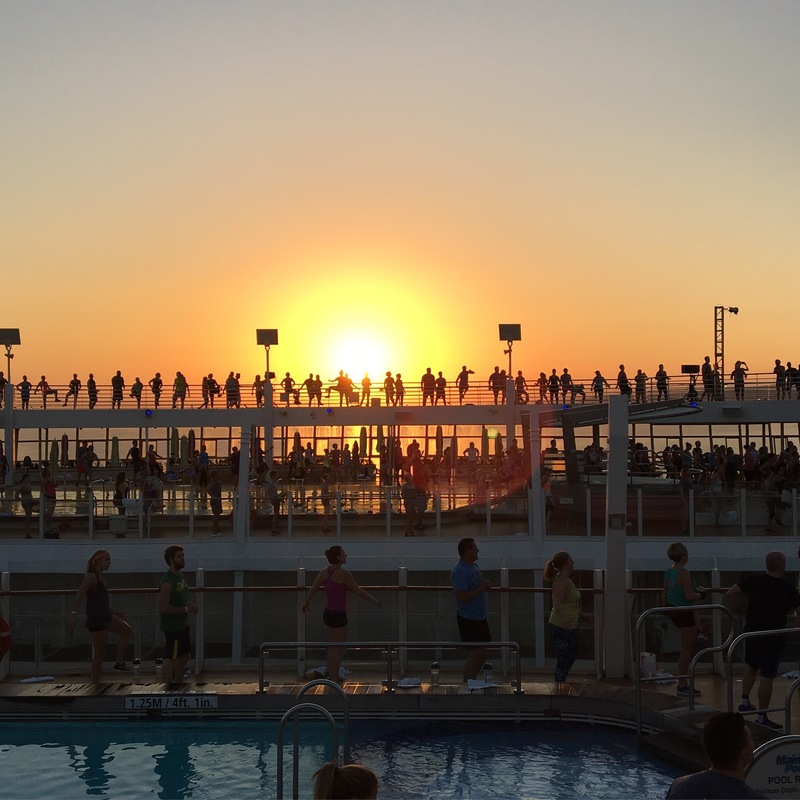 The cruise was filled with 3,000 health and fitness coaches and their guests. There were daily workouts each morning on the pool deck…and there were lots of healthy eating options. 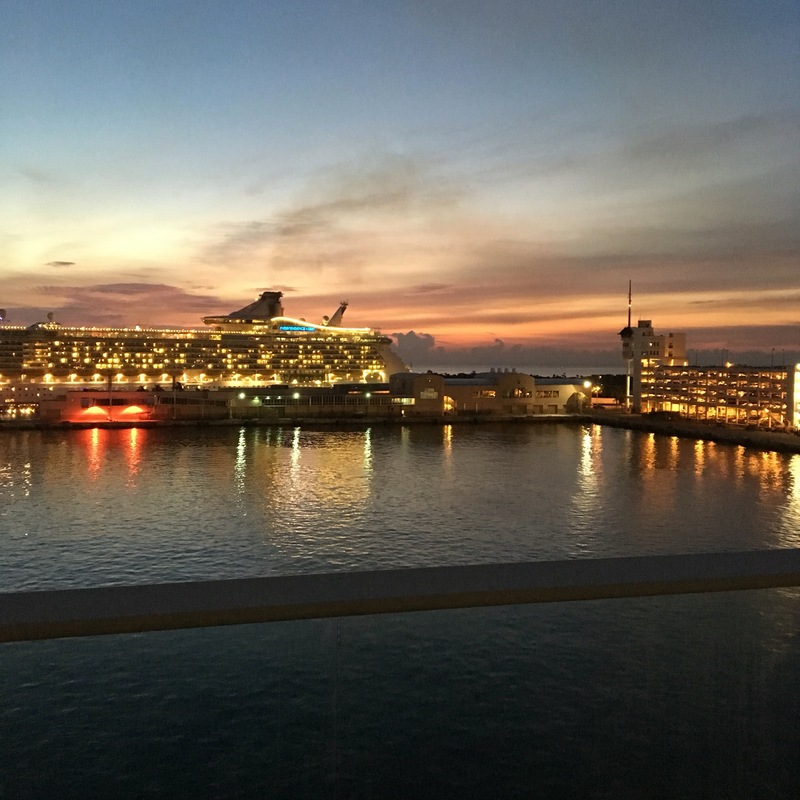 But there also were lots of desserts….and drinks….in fact I even heard that we beat Royal Caribbean’s record for amount of alcoholic beverages consumed on a 5 day cruise…that’s totally crazy! I worked out every single day. For AT least an hour a day, if not more. Each morning I worked out on the pool deck with our trainers. That was about 60 minutes of intense work. 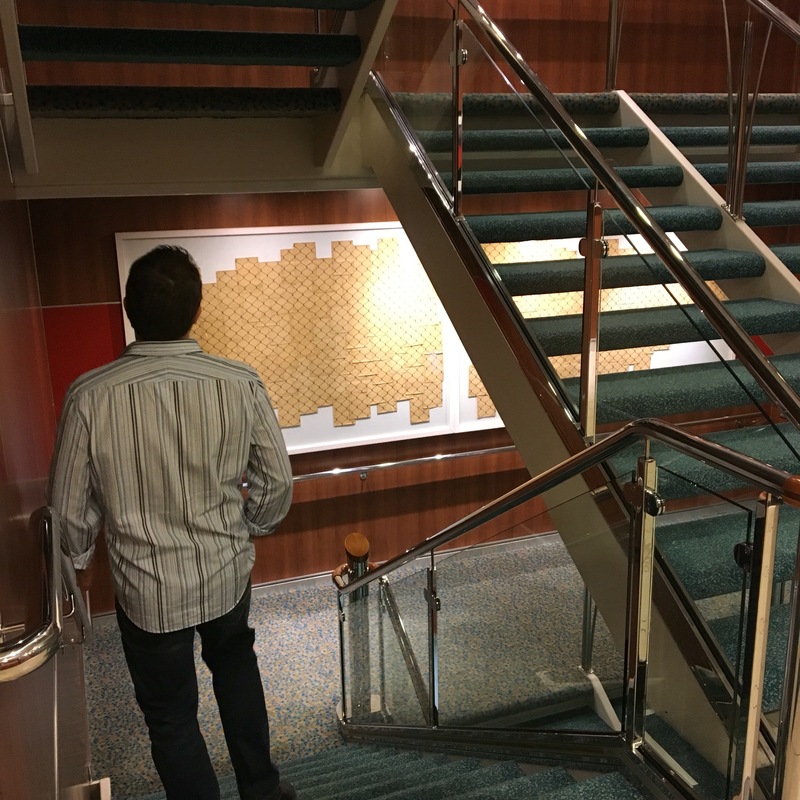 I also walked a lot around the ship – and it is huge! Each day I got in at least 15,000 steps. One day it was even 25,000 steps. In addition to just walking around the ship to get around, I walked around the track for at least 30 mins a day while listening to an audiobook. I also took the stairs instead of the elevator 98% of the time. I made healthy choices at each meal. At breakfast I would often have eggs, fruit, veggies and a piece of toast. Lunch would often be a giant salad with some sort of protein. Dinner was in the dining room each night and I always chose a salad and either fish or a lean protein and veggies. I found the veggies to be lacking at dinner time, so I always made sure to get in a lot of veggies at breakfast and dinner. I ate dessert at lunch and dinner every single day. Yup…I did. I was on vacation, it was there, and I enjoyed it. End of story. I don’t do this at home. Here’s the truth – what you do on vacation doesn’t matter nearly as much as what you do every day. I didn’t drink much alcohol. I’ve never been a big drinker…I would rather have dessert than a cocktail. I think you have to pick and choose your empty calories. I don’t think you can indulge in alchohol and dessert at every meal for a week and not gain lots of weight. Pick one to go overboard with. Or have moderate amounts of both. When I came home and hopped on the scale, I learned that I had gained 3 lbs. I didn’t freak out. I know it is normal for me to fluctuate within a range of 3-5 lbs, especially if I have eaten out a lot. I’m used to eating almost all my meals at home, and when you eat out there is a lot of added salt and sugar in your foods. This causes me to bloat and retain water. I didn’t let these three pounds turn into a slippery slope of more weight gain and an excuse to justify poor eating habits. I needed a reset back into healthy eating, so I knew it was a perfect opportunity to do the 3 Day Refresh. The Refresh is a gentle cleanse/detox that involves lots of water, fruit, veggies, fibre and plant-based proteins. It is great to do after a vacation or when you just want some help getting back on track or when you want a quick win with weight loss to motivate you. We arrived home on Thurday night and I did the Refresh from Friday – Sunday. 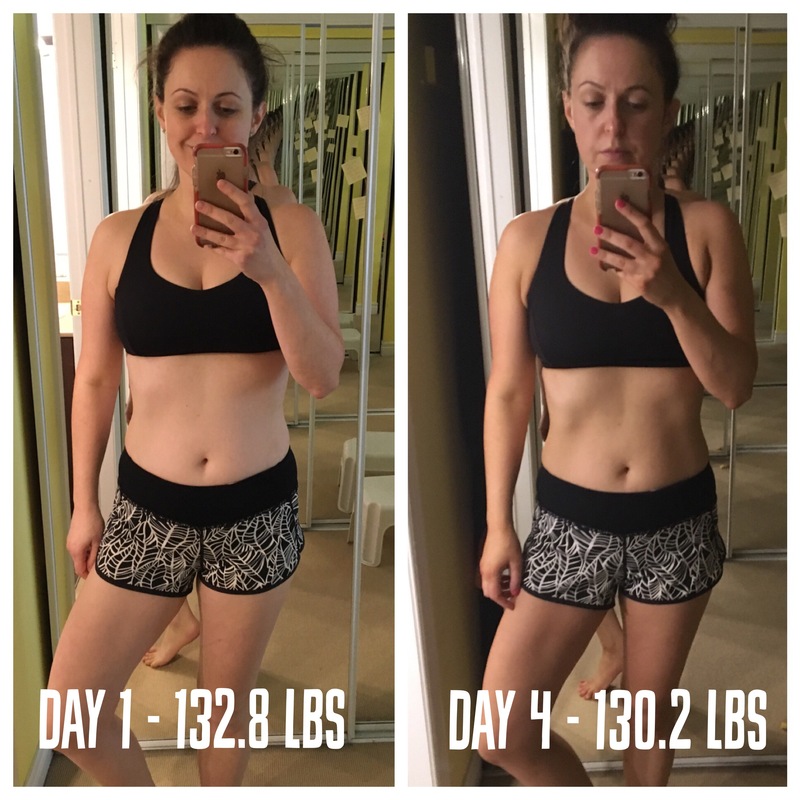 I felt SO much better after the Refresh…I no longer felt bloated and I felt like my body released all that salt and retained water from the cruise. I also did not work out on the Refresh and it was a good chance for my muscles to rest from all the intense exercise I did on the cruise. And guess what? Those three pounds were gone at the end of the Refresh. So I had a great trip. I worked out a lot – for me that is something that I love to do, so it wasn’t a chore but a joy! I ate lots of delicious food, including lots of fruits and veggies and also including dessert. We had a great time and I don’t regret a thing! I also don’t regret jumping right into the Refresh and then from that into my normal healthy eating habits. I think that is key – don’t let a vacation turn into an excuse to throw away all of your hard work and healthy habits. What matters most is what you do most of the time, not what you do occassionally while you travel. I’m putting together my next 30 day health and fitness challenge. We start April 11th. If you have been wanting to start taking better care of yourself – this is the perfect opportunity! Join our supportive community of women who help each other on their journies towards better health. Be a part of our group – work out everyday for 30 mins from the comfort of your home, learn about portion controlled clean eating and enrich your mind, body and spirit! For more info, send me at email at sheryl@ikor.com or PM me via Facebook and I will get back to you ASAP with the details about the challenge.